In late April, Russia’s deputy prime minister helpfully suggested that the United States look into trampolines to get its astronauts to the International Space Station (ISS). The threat to stop ferrying US astronauts on Russian ships, delivered cheekily and via twitter, was mostly a childish diplomatic gesture reflecting rising tensions over Ukraine. However, it exposed a telling snapshot of the changing politics and science of space as it exists today. Space exploration has reflected geopolitical realities and motivations here on Earth since the first Babylonian temple astronomers looked to the skies to mark the passage of time, predict celestial events and solidify social power. Human presence in space, beginning with the launch of the Sputnik in 1957, was founded in the Cold War struggle for global dominance and national glory. Following the fall of the Soviet Union, the world transitioned to a period of rapid expansion in trade and communication (globalization). This was accompanied by a flourishing in the publicly-funded sciences, with private and military translations into technological applications. These terrestrial developments were reflected in and driven by parallel trends in space. As we now shift from a world dominated by the United States government to a more multipolar, corporatized and uncertain world, so too does our exploration of space. Our first forays into space, like the post-World War II world that launched them, were born of the national posturing of the Cold War. The massive resource mobilization of the Space Race yielded the first satellites and InterContinental Ballistic Missiles (ICBMs), moon landings and “Star Wars” – watershed achievements and nightmare fuel in near-equal measure. Despite some humanistic rhetoric about great leaps for mankind, the real motivation behind spaceflight during this period was as unwavering as the US flag on the moon. However, although scientific and engineering advances in this time were a byproduct of the drive to national glory of the Space Race, they continue to be useful to humanity long after the race ended. For example, water purification technology developed for the Apollo missions improved kidney dialysis, and materials developed for the mission are now used for home insulation. The mostly well intentioned (if awkward) rhetoric behind public science in this period has the “international community” supporting large-scale scientific cooperation on goals of real value to all, while still serving multiple domestic political, military and economic needs. In space, too, agencies like NASA, FKA (Russia) and ESA (EU) are mandated to achieve national prestige, foster international cooperation, advance science, develop military technologies, scaffold commercial development and enhance telecommunication. The publicly-funded telescopes, satellites, rovers, orbiters, and, of course, International Space Station have flooded the scientific community with new data about both Earth and space. Private and military industries have capitalized on these programs and technologies to set up systems of satellite-based telecommunications and GPS used to globalize the world, both on Earth and in space. It has been a time of relative peace, but major players are arming to the teeth, on Earth and in space. Despite the unclear and sometimes contradictory goals, international public science in this time has made monumental strides on Earth and in space. 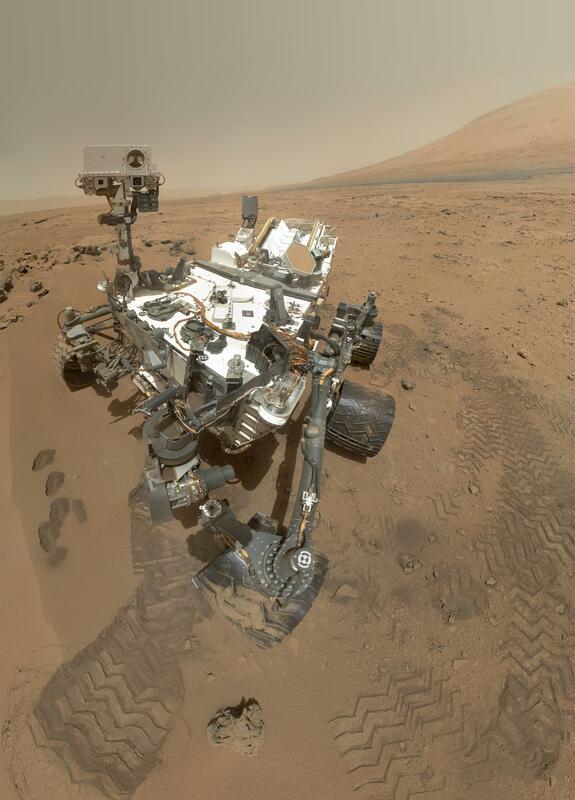 Mars Curiosity selfie! The rover is not only extremely badass, but is also equipped to collect crucial data on the geology and atmosphere of Mars. Our understanding of the planet we live on is dramatically improving as scores of satellites gather data at a resolution and volume unimaginable thirty years ago. At the same time, we are becoming familiar with our solar neighborhood, as orbiters like Cassini and rovers like Curiosity explore planets once so obscure they are named after gods. Further afield, we are discovering planets outside our solar system and peering into other galaxies and into the past with tools like the Hubble Space Telescope. The International Space Station is undoubtedly the crown jewel of this era, despite doubts about its scientific value. It truly is beautiful to think of six of humanity’s best and brightest, orbiting the Earth for months at a time, conducting research from which we all might benefit. In many ways, we are living in a golden age of scientific progress, and that too is reflected in space. The “international community” is holding together for the moment, but the facts on the ground are changing fast. Countries like India and China are gaining power, the US is suffering a new crisis of confidence, and once rock solid configurations of geopolitical power start to give way everywhere from Eastern Europe to the South China Sea. Added to this mix, private corporations are taking on previously public roles. Again, these trends are reflected in the shifting priorities and players in space. This is why the Russian trampoline threat is such an interesting moment. It may just be a temporary kerfuffle, but it could also represent a real, permanent transition to a new era of international relations. This new geopolitical structure will have deep implications for how publicly funded science is performed. Worldwide, national governments seem ready to de-emphasize international cooperation and resume an expanded Space Race. 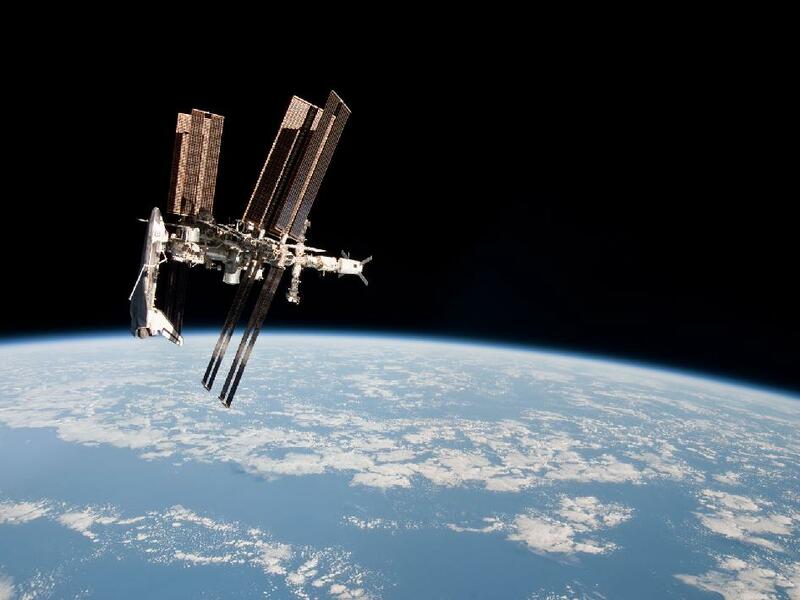 Russia and the US are drifting away from international cooperation, calling into question the fate of projects like the ISS. At the same time, newcomers are unveiling impressive space projects of their own; China and India have successfully launched a rover and an orbiter (respectively) to the moon. South Korea joined the club of nations able to launch satellites last year. In another reflection of events on Earth, private corporations are arriving on the scene in a big way, becoming major actors themselves rather than just beneficiaries of state-funded space programs. Making money in space (beyond communications satellites) is rapidly shifting from far-fetched science fiction to a reasonable bet, and investors are taking note as money piles into companies like SpaceX, Bigelow, and Planetary Resources. Attitudes about this range from ecstatic to cautious, but few people are questioning the financial potential on the near horizon. Right now, most projects are confined to government contracts to build and resupply the ISS or clean up space debris, but as these companies build capital and technology, markets like low gravity experimentation for private clients and space tourism beckon. Official US policy has already made room for these developments, ceding low orbit traffic to industry through the Commercial Orbital Transportation Services program. As we go from large international projects like the ISS to national or smaller coalition-based programs, we can hope that the focus on scientific value to humanity doesn’t give way to more resource and nationally-minded programs. We can choose national programs that complement each other, and keep cooperation on the scientific level strong and focused on our common needs. Cooperation is just as crucial in a multipolar world as in an American-dominated one. Space will be a major venue for global problems we must solve together, for example against asteroid collisions or climate change. Although profit for investors is ultimately the motivation behind private space ventures, we can hope that the technologies developed can further the ability of the larger human community to make use of space. On this front, there is reason for optimism: Elon Musk, the owner of SpaceX, also owns Tesla Motors, which recently made all of their patents available to the public. However, we should keep in mind that the humanistic rhetoric coming from private corporations is even more suspect than that of the Cold War United States. The bottom line for private industry is the bottom line. The night sky has always been a canvas on which we paint our desires and insecurities, and the history of space exploration is ultimately a history of us. Over the past quarter-century, space technology has both driven and reflected the globalization and American hegemony of the world we live in. We are going through a transitional time right now, and that is inevitably reflected in the shape of space exploration. Our hopes for a better future can be too, even if that future looks quite uncertain at the moment.